This is the generation of gamers, from Grand Theft Auto to World of Warcraft, a generation hooked on action-packed video games. Most are fantasy, but there are also the ones that simulate wars and real events of the past. 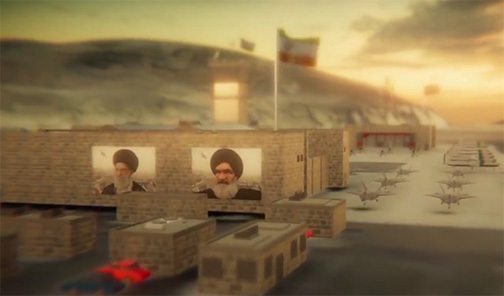 A recent Youtube video by an anonymous Saudi imagines a game scenario in which the Saudis use sophisticated American military hardware to successfully demolish Iran’s Bushehr Nuclear Power Plant, Badir Airbase, and Mehrabad International Airport and then send ground forces to liberate Tehran from their Shi’a enemy. But, of course, it is just a game, isn’t it? 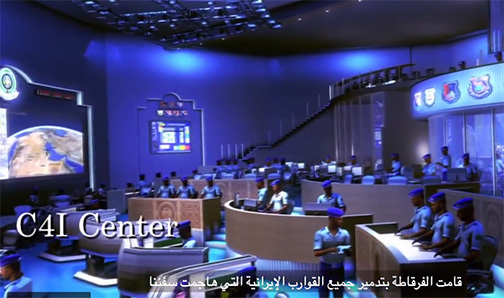 It is difficult to reconcile the hubris of the video with the reality that Iran has a much stronger military presence than the Saudis, despite their largesse in buying massive amounts of military equipment in recent years. It is one thing to buy weapons, quite another to know how best to use them. As an Israeli official once noted about the Saudi’s arsenal: ”It’s just a giant, useless heap of metal.” The inability of a Saudi-led bombing campaign to win the brutal war against Yemen’s Huthis suggests that it would be a long time before the Saudi military achieves respect. If one takes away the continual American support, the prowess of the Saudi military is even more suspect. Next to Israel, most experts agree that Iran has the most powerful military, not to mention an active cyberwarfare division. 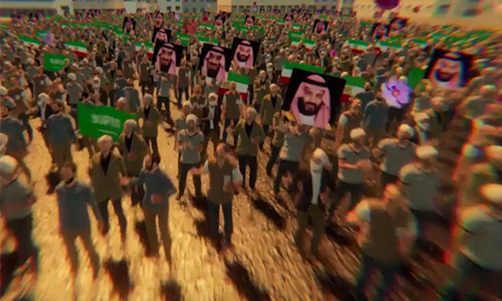 Perhaps the least believable part of the video is the end, where Saudi troops enter Tehran and are greeted as heroes with posters of Bin Salman streaming through the air. Given that Iran has almost four times the population of Saudi Arabia and there is no love lost between most Iranians and the Wahhabi Saudi state, this is pure fantasy. It is probable that the recent Saudi video is in response to an animated Iranian video from January 2016 that pictured Yemeni missiles destroying the ARAMCO oil fields. This is just as ludicrous an idea as that of the Saudis taking control of Tehran. One could argue that animated videos parroting games are nothing to worry about. But reality is often not far behind the makers of fantasy. It is reported that the Saudis are aligning themselves with Israel in the hope that Israel with Trump-eted American support will do a preemptive strike on Iran. At least that would solve the problem of deciding what to do about the Iran nuclear deal negotiated by President Obama and Europe. Evangelical apocalypse promoters are eager for any fighting that could escalate into an Armageddon scenario. Recently WHO has created a new mental disorder category called “gaming disorder.” The most recent scientific research suggests that there are both positive and negative impacts on functioning of the brain. But what about those who take the fantastic scenarios in animated videos and video games seriously? Predictions of an end-time scenario exist in all three major monotheisms. There are some Muslim zealots who are as eager to see the return of their Mahdi as Bible-thumping Christians are to be raptured into heaven before the hell of tribulation breaks loose on earth. For these believers in prophecy, a future Armageddon is no game. But it is surely as much a mental disorder, if not more so, than playing Mario.